Poverty is a complex and multidimensional phenomenon. According to Unicef (2005) “Children living in poverty experience deprivation of the material, spiritual, and emotional resources needed to survive, develop and thrive, leaving them unable to enjoy their rights, achieve their full potential or participate as full and equal members of society”. Child poverty has different causes and effects in respect to poverty in general and the impact of deprivation on children could be irreversible. To measure poverty and well-being of children, in addition to traditional economic indicators, should be used a multidimensional basis that includes not only income or consumption level but also health, nutrition, education, shelter, ecc.. Nevertheless, in rich countries like Italy, there is a high correlation between low disposable income measure of poverty and the general level of poverty. The relative poverty indicator (hereinafter more simply poverty) identifies the conditions of economic disadvantage of some subjects compared to other and it is calculated on the basis of a conventional threshold (line of poverty) that identifies the value of the income below which a family – and the individuals who compose it – it is considered poor. The incidence of poverty is the ratio between the number of individuals that are below the poverty threshold and the total of individual. The phenomenon of relative poverty, as well as by the extent of its spread (incidence or headcount), can also be described in relation to its depth (intensity). In 2010, child poverty rate among children was 22.6% (almost one child out of four is poor), more than 21.3% in 2008 and 20.3% in 1995. The different rate of development in all the socio-economic fields between the North and the Centre of Italy towards the South has caused structural differences in the living conditions of resident population: in terms of child poverty Italy appears like a country divided in two (figure 1). More than in other European countries, in Italy the territory plays a fundamental role in the distribution of poverty. Moreover, in the Southern regions we can find most of the factors causing the condition of economic poverty. 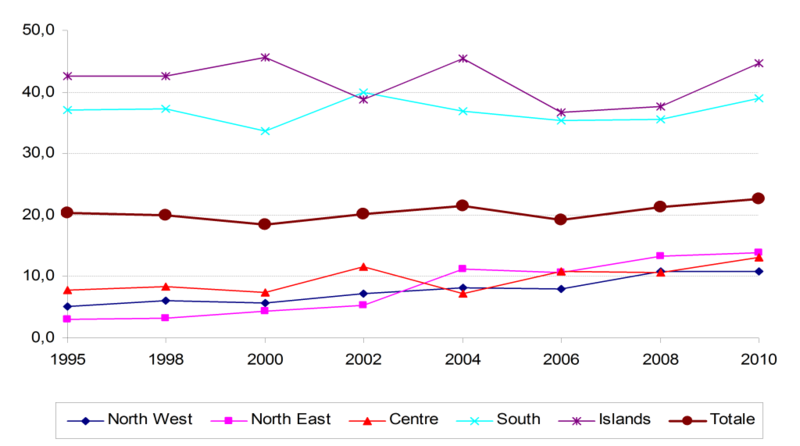 The gap between Centre-North and South is considerable. In the last 15 years child poverty increased in the most developed part of Italy (from 5.1% to 10.9% in the Northwest, from 3.1% to 14% in the Northeast and from 7.8% to 13.2% in the Centre), but it remained far below the national average. Conversely, in the South (Sicily and Sardinia included) poverty is substantially stable over time, but 4 out of 10 children suffer an economic disadvantage. A child born in the South has a higher chance of growing up in a poor family. The situation is even worse in those families where only one parent is present (figure 2). In all European countries, children born into foreigner families are more exposed to the risk of poverty. This type of family combines all the main determinant factors of the phenomenon: very large families with a low participation in the labour market, a high presence of jobless persons, or supported by a single salary, and usually with low levels of language skills and limited earning capacity. At the end of 2010 foreigners in Italy was 7.5%, with a presence in the North and in the Centre that was close to 10% and only 3% in the South. Poverty rate for Italian children is at 19%, a third of that of their foreign counterparts, which reaches 58.4% (figure 3). At the end of the 90s (table 1) the poverty intensity (percentage of the disposable equivalent income of families below the poverty line), was particularly high (38.1% in 1998). In subsequent years it gradually decreased from the minimum value of 26.9% on 2006. Over the past four years it increased again up to 32.3% in 2010. The poverty intensity is higher in the families where there are children (35.1% in 2010). If the householder is foreign the poverty gap is much lower (23.2%) than that of a family headed by Italian (38.9%) and the difference is greater in 2010 rather than in previous years. Poor families with children in Southern Italy have a higher intensity of poverty than those living in the Centre-North. Families living in the South or in the Islands, have both a higher incidence of poverty and higher level of intensity and therefore they are doubly disadvantaged. The phenomenon of child poverty is particularly spread in Italy and the situation, instead of improving over the time, seems to be worsened in 2010, as a consequence of the economic crisis affecting the country. The current situation does not seem very different from that of 15 years ago, with a child poverty in Southern Italy, much higher than in the Centre-North. The gap is only slightly reduced in recent years, due to a greater presence in the Centre-North of foreign population, which has an incidence of poverty four times higher than that of Italian families. Child and youth poverty, as well as being serious in itself, tends to generate an intergenerational transmission of poverty (poor young people will generate poor children who will struggle to get out of this condition). It needs to break the link between being born poor and remain poor for the rest of the life. In a society, minors are vulnerable people who need more protection. First of all because they are not responsible for their economic conditions and the State must take over those families that are not able to ensure the fulfilment of basic needs. The second reason is that children are the future of the society and their current state of deprivation weakens the potential human capital. Finally, in an advanced society like Italy, situations of strong heterogeneity among young people are intolerable and they may lead to social conflicts between those who have too much and those who have scarce resources. Child poverty rate and gap, measured in terms of economic deprivation either over time and across geographic areas, supplies to decision makers useful information to define specific social policies with the aim to reduce the spread and depth of child poverty. Possible intervention is to create new decent jobs into the poorest areas or to increase in-kind childcare transfers to low-income families by enabling parents (and especially mothers) into work. In this paper the economic conditions of the family has determined using the Bank of Italy Survey on Household Income and Wealth (SHIW), whose data are available every two years. Istat disseminates the relative and absolute poverty estimations for the households residing in Italy, based on Households Budget Survey data and also it disseminates economic deprivation indicators that identify the condition of discomfort and need of an individual in a multidimensional level (EU-SILC Survey). An individual is poor (relatively speaking) if he belongs to a family whose equivalent disposable income is under the half of the median. The equivalized disposable income is obtained by dividing the disposable income of the family by the number of equivalent components: Yeq=Y/n eq. The number of equivalent components of a family is the sum of the individuals who compose it, in which the reference person is worth 1, people who are at least 14 years is worth 0.5 and children under 14 years is worth 0.3 (OECD equivalence scale). The incidence of poverty is the percentage ratio between the number of individuals which falls below the threshold of poverty and the total number of individuals. The intensity of poverty or poverty gap is a percentage of far off households disposable income from the poverty line. It gives the total resources needed to bring all the poor to the level of the poverty line.